Don’t worry: I’m not going to insult your intelligence by indulging in any pretense of mystery over who’s going to win college sports’ most hallowed hunk of bronze on Saturday night. Oregon quarterback Marcus Mariota is going to claim the Heisman Trophy, probably by a significant margin. He enters the weekend as the undisputed favorite according to pretty much everyone who keeps track, and he cleaned up during ESPN’s general college football awards show on Thursday night. Of course, a lack of suspense on the eve of the race’s denouement isn’t exactly unusual. Can you recall a Heisman announcement that wasn’t a foregone conclusion? Charles Woodson over Peyton Manning, maybe, but even then the final vote wasn’t all that close. The Heisman Trust, which oversees the voting and the ceremony, has done its best to gin up a little more drama over the past few years by cracking down on voters who reveal their ballots before the announcement — the idea being that such foreshadowing discourages people from tuning in for the big reveal, although in years when the vote is actually close the opposite is more likely to occur — resulting in far fewer leaked ballots floating around this year to serve as straw polls. Even without the typical glimpse into the voters’ minds, though, Mariota’s coronation appears imminent, and there’s little hint of contrarian chatter. 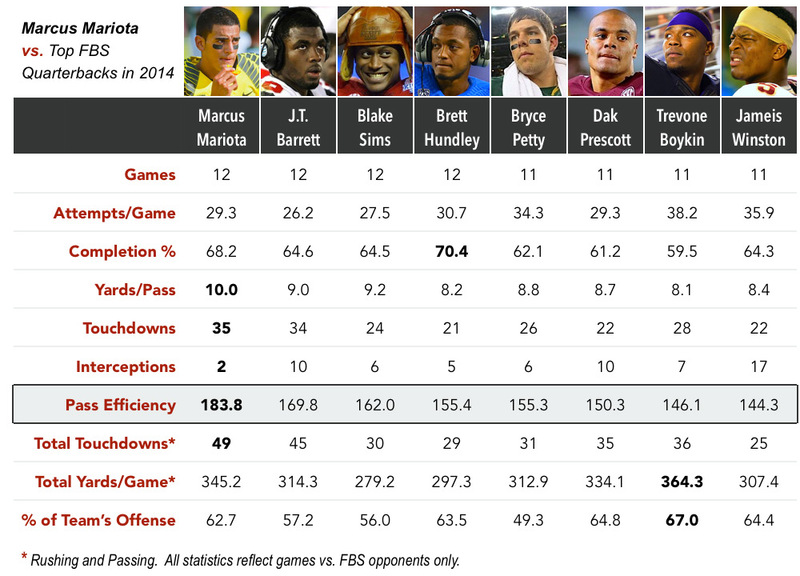 In the Heisman Trophy race, the front-runner really does always win. One reason the outcome seems so inevitable is that Heisman winners tend to be cut from the same cloth, and that template happens to fit Mariota about as snugly as it’s fit anyone in the past decade. One, he’s a quarterback, and 12 of the 14 winners since the turn of the century have been quarterbacks. Two, he’s a known quantity, having logged 39 career starts for a team that’s spent exactly three weeks outside of the top 10 in his three years at the helm.1 Three, his team will play for a shot at the national championship in January.2 Four, he has a Boy Scout’s reputation off the field. Everyone who gets an invite to New York as a Heisman finalist can check at least a couple of those boxes; the last guy who could check every one of them was Oklahoma’s Sam Bradford back in 2008. So, preemptive congrats to Mariota, the first Duck to earn the title of most outstanding player in college football and an upstanding addition to the fraternity. Now for the really important question: Does he deserve it? A 35-to-2 touchdown-to-interception ratio versus FBS opponents doesn’t require a whole lot of elaboration. For the record — because there are always skeptics whose first response to obvious success is he didn’t play nobody! — Mariota has played as many games against currently ranked teams (five)4 as anyone on that chart, and as many teams with winning records (seven) as anyone up there except Alabama’s Blake Sims, who faced eight. What the chart doesn’t show, and what arguably separates Mariota more than any other factor, is his machine-like consistency: Mariota posted his second-lowest passer rating of the season in last weekend’s Pac-12 championship victory over Arizona, and even then he accounted for 346 yards of total offense, five touchdowns, and zero turnovers in a 51-13 blowout. Against FBS opponents, Mariota accounted for at least 275 yards of total offense, threw multiple touchdown passes, and finished with an efficiency rating north of 150.0 in every single game. (I feel like I should emphasize that: every single game.) Not coincidentally, Oregon scored at least 38 points in every game except its 31-24 loss to the Wildcats in October, and only once failed to record a victory by a double-digit margin. No one else on that chart can say any of those things. This wasn’t exactly a banner year for above-the-fold signal-callers. Bryce Petty and Jameis Winston came up well short of their gonzo 2013 numbers, and Brett Hundley was only incrementally better in a year that was supposed to be his great leap forward; Dak Prescott, the hero of October, faded down the stretch; J.T. Barrett faced only one ranked opponent before his season-ending ankle injury; Sims was buoyed and frequently overshadowed by gobs of surrounding talent; and Trevone Boykin’s output came with a slight whiff of quantity over quality in TCU’s revamped offense. None of those guys would have been especially attractive candidates to make the trip to New York in most other seasons, either. So let’s expand the context a bit. 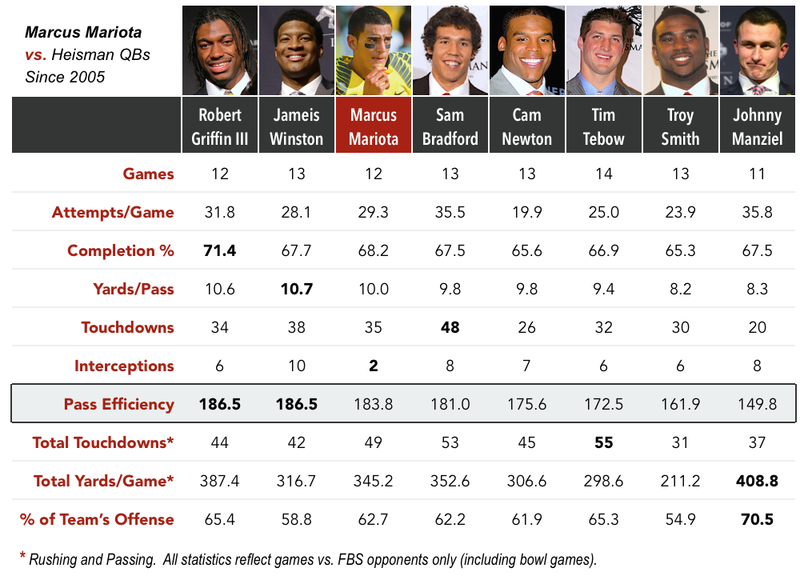 How does Mariota’s season look when we pit it against other Heisman-caliber campaigns over the past decade? Pretty good! Among the eight gold-plated names above, Mariota comes in fourth or better in every single category — note that his production outpaces Cam Newton’s sensational 2010 output across the board — and that ridiculous TD-to-INT ratio stands out even here. All told, Mariota’s presumed swan song season compares very, very favorably to RG3’s meteoric 2011, with the added bonus that Mariota’s team (unlike Griffin’s) still has realistic championship ambitions. Mariota looks right at home in this company. If there’s an argument against Mariota, it’s the absence of a visceral wow factor: Unlike most of the guys who have found themselves in his position, his résumé is conspicuously missing the proverbial “Heisman moment,” the singular play (or series of plays, in the case of a clutch drive) that transcends the stat sheet and strikes onlookers dumb with its enduring brilliance. Mariota’s ostensible competition on Saturday, Alabama wide receiver Amari Cooper and Wisconsin running back Melvin Gordon, have the numbers to justify their presence — Cooper leads the nation in receptions and receiving yards, having smashed single-season and career records at Alabama in both categories; Gordon leads the nation in rushing yards and touchdowns — but their candidacies also hinge to a much larger degree than Mariota’s on spectacle. Gordon was already a star, but it was his record-breaking, 408-yard masterpiece against Nebraska that made him a household name and a legitimate factor in the Heisman race. Cooper was already bound to be the first receiver off the board in the upcoming NFL draft, but it was his 224-yard, three-touchdown flambé of Auburn’s secondary in the Iron Bowl that guaranteed his place as a finalist. When those two are at their best, the stats are irrelevant: Merely seeing is believing. Still, no one has been at his best as consistently and with as little apparent effort as Mariota. Cooper has looked dominant at times, but can hardly be considered the engine of the run-oriented Bama offense from one down to the next. In his team’s biggest game of the year, Gordon was a nonfactor in the Badgers’ 59-0 collapse against Ohio State. In that sense, Mariota’s smooth, routine competence is a more compelling endorsement than any highlight reel could ever be. He shows up every week and patiently, play by play, does his job better than anyone else. Like all upper-echelon quarterbacks, Mariota’s ultimate legacy at Oregon will revolve around what happens after Saturday night, and whether his team — unlike Bradford’s, or Smith’s, or Jason White’s, or Eric Crouch’s, or many other Heisman heroes who have gone on to watch the ultimate goal slip from their grasp — can punctuate his sterling career with a national championship. But there’s still plenty of time for that discussion. For now, Mariota can take the stage secure in the title of most outstanding player in the nation. Mariota was also an obvious Heisman favorite coming into the season, although that doesn’t mean as much these days as it used to. Nine of the past 14 winners were scheduled to play in the BCS championship game; this year, Oregon is set to host Florida State and last year’s winner, Jameis Winston, in a playoff semifinal in the Rose Bowl. Well, gushed over Mariota in-depth is more accurate. A category that doesn’t include Stanford, owner of the best total defense in the Pac-12. What Does The U Mean to You?